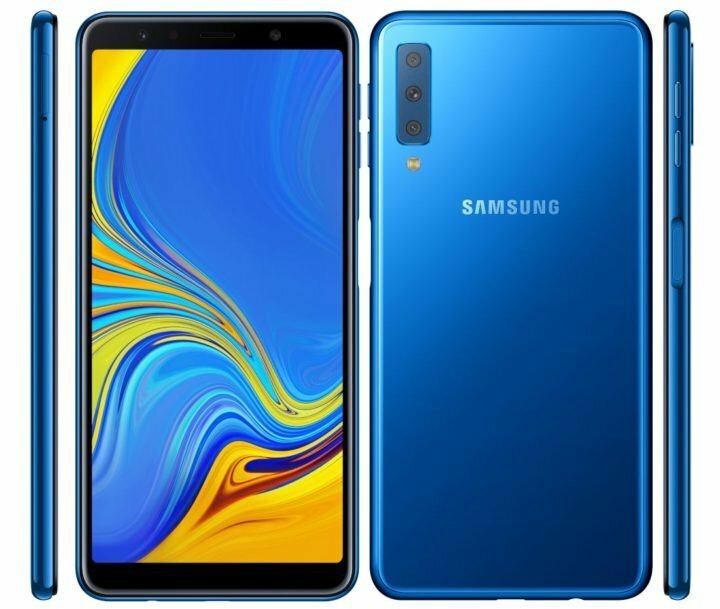 Samsung has officially announced the Galaxy A7 (SM-A750F), the company’s first ever smartphone to pack a triple rear camera sensors. Since the launch of Huawei P20 Pro, we knew that sooner or later, Sammy is going to follow suit. Both the Samsung Galaxy A7 (2018) and the Huawei P20 Pro packs similar camera set-up, except the fact Samsung Galaxy A7 (2018) has a much, much more weaker camera configuration, and of course, a more affordable price tag. 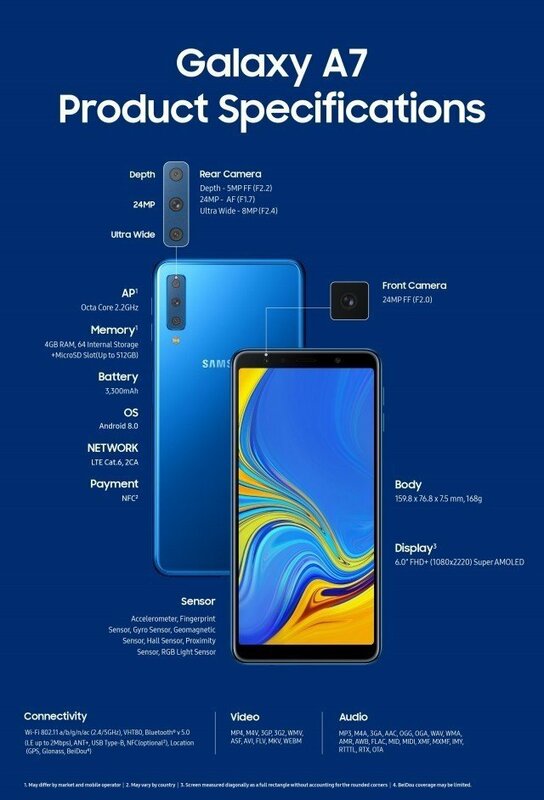 The Samsung Galaxy A7 (2018) camera setup includes a 24-megapixel main sensor with f/1.7 aperture, a secondary 8-megapixel 120° Ultra Wide Lens for wide-angle photos and the third 5-megapixel camera to capture depth information for portrait shots. Up front, the device packs a 24-megapixel front camera which can automatically combine four pixels into one pixel in low light conditions, to allow in more lights. It also has an adjustable LED flash, Selfie Focus, Pro Lighting Mode and AR emoji. The display on the Samsung Galaxy A7 (2018) is a 6-inch Full HD+ Super AMOLED screen. Processing prowess comes from a 2.2GHz Octa-Core processor which could be Exynos 7885. Other specifications of the Samsung Galaxy A7 (2018) includes a side-mounted fingerprint scanner, support for Dolby Atmos, Android 8.0 (Oreo) and a 3300mAh battery, built into a metal frame with glass back panel. 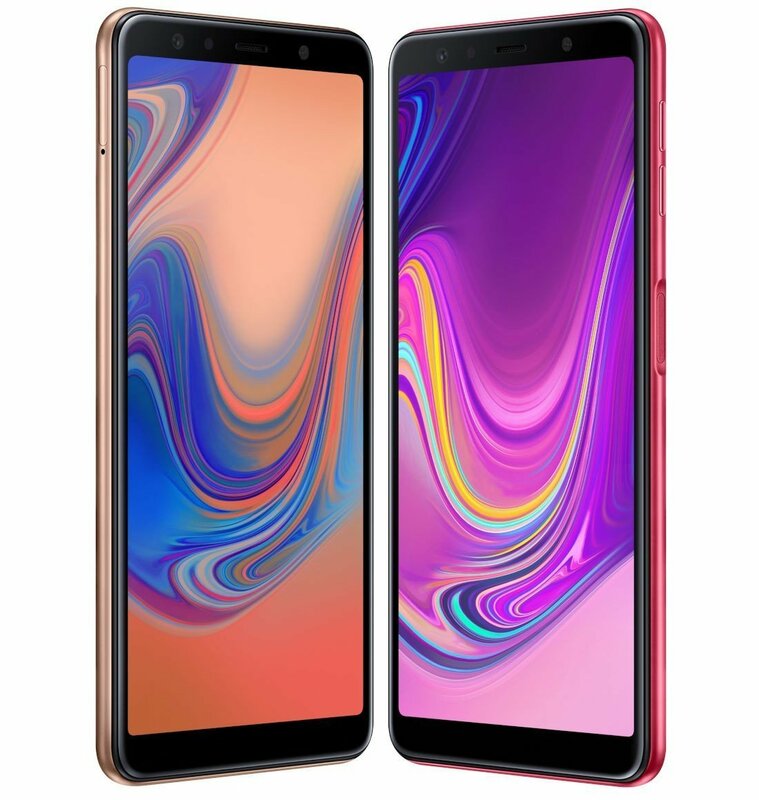 The Samsung Galaxy A7 (2018) comes in Blue, Black, Gold and Pink colors, and available in three configuration – 4GB/64GB, 4GB/128GB or 6GB/128GB. The base model with 4GB RAM and 64GB internal storage is priced at $407 and will roll out in select European and Asian markets starting from October.